Laser dentistry is a new technique that can improve the precision of your treatment while minimizing pain and recovery time. Procedures performed using soft tissue dental lasers may not require sutures or stitches. Certain laser dentistry procedures do not always require anesthesia. 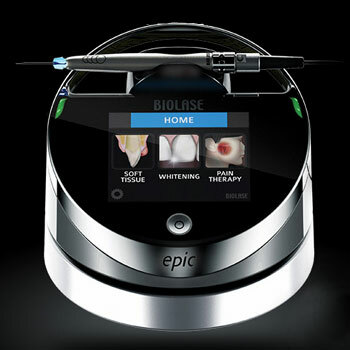 Laser dentistry minimizes bleeding because the high-energy light beam aids in the clotting of exposed blood vessels. There are a variety of uses for lasers in the field of dentistry. Lasers can be used for cavity removal, teeth whitening, gum reshaping, oral surgery, the removal of bacteria from periodontal pockets, and treatment of cold sores and canker sores. Dental lasers emit light that deliver quick pulses of heat energy to the treatment area. Various wavelengths are used depending on the type of tissue being treated. Surgical lasers are more accurate than traditional dental treatments and allow the dentist to conserve as much bone and tooth as possible. 97% of patients who experience Waterlase treatment would recommend it to their family and friends.